Feel free to judge me for this quick shot of my pecan pie, snapped at a red light on the way to Grandma’s house for Christmas. 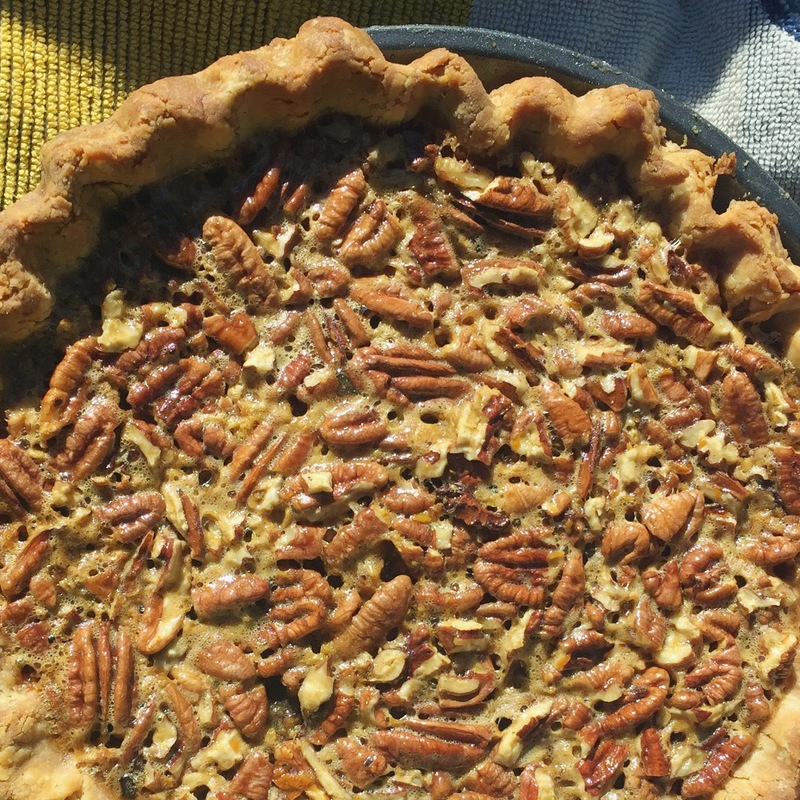 The pecans for this pie were a gift from a friend, gathered by another friend from her front yard. It is embarrassing how long it took me to shell enough to get 2 cups of pecans. But it did solve the eternal pecan pie dilemma of whether to chop the pecans (for easy slicing) or leave them whole (cuz they look so pretty). I got exactly 3 whole pecan halves out of my two cups of cracked ones so the pie features a rustic mix of big and smaller pecan bits. There’s a great recipe for a corn syrup-less pecan pie in the lovely Summerland cookbook, but this time around I just wanted to go traditional, and made limited modifications to the New Best Recipe’s pecan pie. It was delightful. 1. In a medium bowl, whisk together flour, sugar, and salt. Add cold, cubed Earth Balance (or butter) and, using your fingers or a pastry knife, work the butter into the flour mixture. Quickly break the butter down into the flour mixture, some butter pieces will be the size of oat flakes, some will be the size of peas. In a small bowl, stir together the egg and coconut milk/lemon juice mixture. Create a well in the butter and flour mixture and pour in the liquid mixture. Use a fork to bring the dough together. Try to moisten all of the flour bits. On a lightly floured work surface, dump out the dough mixture. It will be moist and shaggy. Sprinkle generously with flour. Shape dough into two disks and wrap in plastic wrap. Allow dough to rest in the fridge for 1 hour. Dough is easiest to roll out when it’s cold and rested. 2. Preheat the oven to 375. On a floured surface, roll the dough into an 11 inch circle and carefully lift into a 9 inch pie plate. Fold the excess crust under the edges and crimp with your fingers. Refrigerate for another 40 minutes, until quite cold. 3. Line the pie shell with parchment or foil and fill with pie weights or dried beans. Bake for 25-30 minutes, until the dough looks dry and light in color, then remove the foil/parchment and weights and bake until lightly golden brown, another 5-10 minutes. 4. While the pie crust is baking, make the filling (the hot filling should be poured into a still hot crust, so don’t do the first steps too far ahead). Melt the Earth Balance in a medium heatproof bowl set in a skillet of water maintained at just below a simmer. Remove the bowl from the skillet; stir in the brown sugar and salt with a wooden spoon until the butter is absorbed. Beat in the eggs, then the corn syrup and vanilla. Return the bowl to the hot water; stir until the mixture is shiny and hot to the touch. about 130 degrees on an instant-read thermometer. Remove from the heat; stir in the pecans. 5. As soon as the pie shell comes out of the oven, decrease the oven temperature to 275 degrees. Pour the pecan mixture into the hot pie shell. 6. Bake on the middle rack until the pie looks set and yet soft, like gelatin, when gently pressed with the back of a spoon, 5- to 60 minutes. Transfer to rack and cool completely before cutting, at least 4 hours.